Cold weather has arrived and I’m making a recipe that my Mom used to make… with my own spin on it! 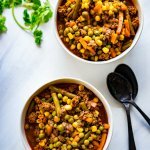 One Pot Vegetable Beef Soup was a favorite of mine growing up and I’m excited to share it with you today! I can still remember my Mom making this soup growing up. Many times it was on a Saturday or Sunday afternoon, and my memories tell me it was usually on a rainy and cold fall/winter day. It truly doesn’t get much easier than this recipe. 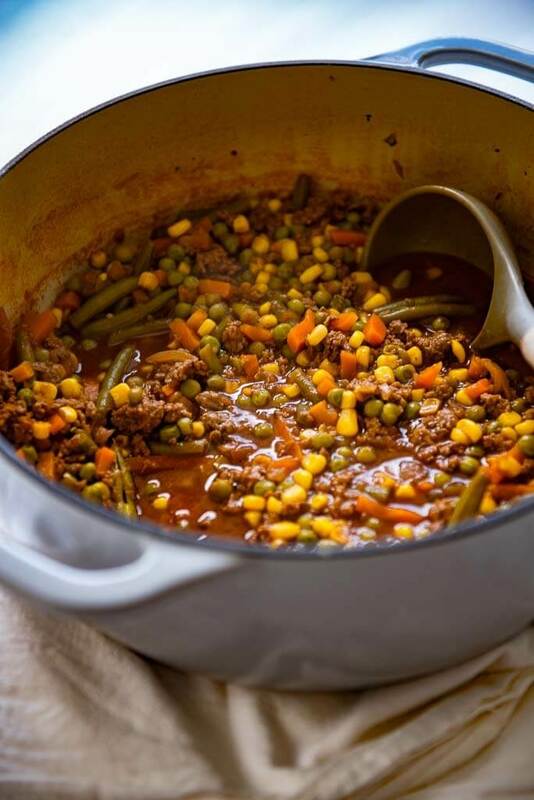 For my version I am using ground beef so you just brown the ground beef and add in all the remaining ingredients and let it simmer on the stovetop until the frozen vegetables are cooked through. This is also a recipe you could easily let simmer on the stovetop for a few hours. To make this I used my favorite dutch oven. You know you’ve really become an adult when you pull out a pot in your kitchen and it just makes you excited to use it because you think it’s so darn pretty. I know. I’m embracing my 30’s fully and loving every second of it! For my recipe I’m keeping it very simple by only using a few spices. 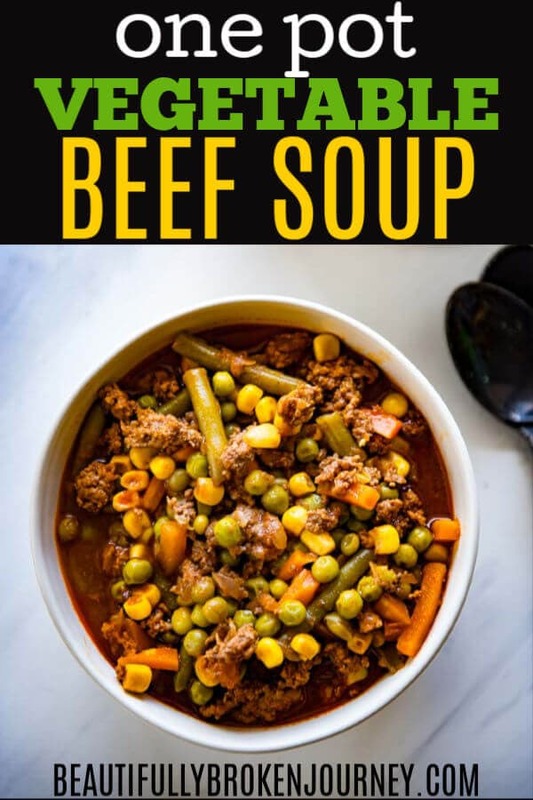 I used a 2lb bag of frozen vegetables that included corn, carrots, peas and green beans because those are the veggies Mom always added and I loved it. You can use whatever vegetables your family enjoys! Even as an adult I sneak veggies into my meals so when I create a recipe that is packed with vegetables that my kids will eat it makes me happy. 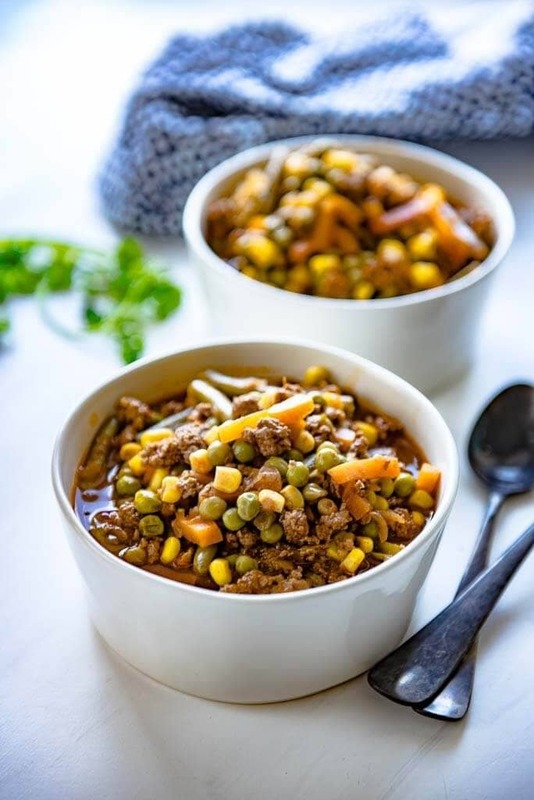 This soup is a bowl of comfort and packed with nutrition, a perfect combination! 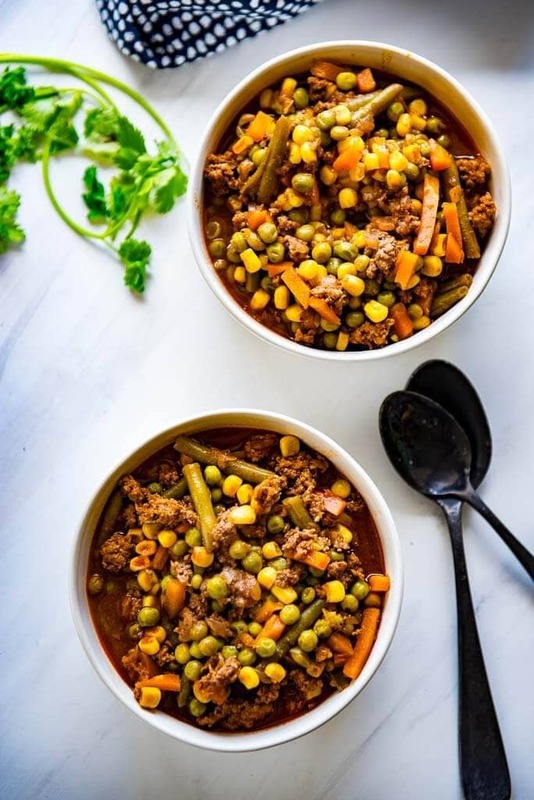 This easy One Pot Vegetable Beef Soup is made on the stove top and is a fantastic way to get more veggies on the table! Heat olive oil in dutch oven, add diced onion and garlic and saute for 3-4 minutes until onions are tender. Add lean ground beef and cook until meat is cooked through. Add all remaining ingredients and allow to simmer on medium heat for about 45 minutes.